A sand grain of volcanic glass under the petrographic microscope. Its amorphous nature makes it disappear in cross-polarized light (bottom frame). Scale box in millimeters. Volcanic glass is the amorphous (uncrystallized) product of rapidly cooling magma. Like all types of glass, it is a state of matter intermediate between the close-packed, highly ordered array of a crystal and the highly disordered array of gas. Volcanic glass can refer to the interstitial, or matrix, material in an aphanitic (fine grained) volcanic rock or can refer to any of several types of vitreous igneous rocks. Most commonly, it refers to obsidian, a rhyolitic glass with high silica (SiO2) content. Pumice, which is considered a glass because it has no crystal structure. Apache tears, a kind of nodular obsidian. Tachylite (also spelled tachylyte), a basaltic glass with relatively low silica content. Sideromelane, a less common form tachylyte. 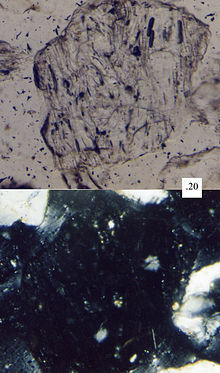 Palagonite, a basaltic glass with relatively low silica content. Hyaloclastite, a hydrated tuff-like breccia of sideromelane and palagonite. Pele's hair, threads or fibers of volcanic glass, usually basaltic. Pele's tears, tear-like drops of volcanic glass, usually basaltic. Limu o Pele (Pele's seaweed), thin sheets and flakes of brownish-green to near-clear volcanic glass, usually basaltic.